Margo Coates and Dragonfly Longarm Quilting Services created for me an heirloom quality quilt from an "aged" quilt top that I discovered in my Mom's things when she went to a nursing home. Margo not only did an excellent job of finding the right backing, perfect for the age of the quilt fabrics, but she went the extra steps of getting the fabric dated by the Quilt Museum in Lowell and curing the "aged" look to the fabrics. 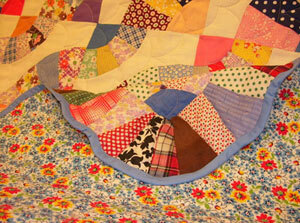 I couldn't have asked for anything better - the quilt turned out fabulously. The pastor of my church was being transfered after 7 wonderful years of ministry. Our Women's Group wanted to do something special for him to remember all that we had been through together. Knowing Margo's love of quilting I asked for ideas. 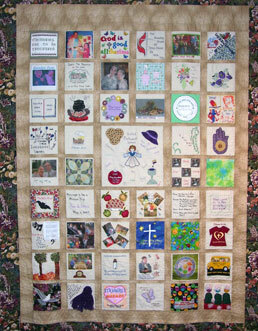 She took on the challenge of a 50 square queen size memory quilt. Cut to size squares were made available to anyone with an idea. Classes were held by Margo to help those that needed help getting their ideas onto the square using many different techniques. So that the congregation felt that this was their gift, times were scheduled for people to get together to help pin, sew and iron squares and sashing together. Always available to answer questions and to help when projects were not going as expected...it was a pleasure working with Margo. The finished quilt is a 'master piece'!! The precision of sewing each, not so perfect, square together and adding the beautiful sashing was appreciated by all. Margo perfectly complimented each square with custom quilting around everyone's 'memory'...some must have been a real challenge. At last a beautiful border of hearts complimented this massive labor of love. WOW .... is all I can say. I received the quilt today. It is absolutely exquisite! I'll be proudly displaying it on our family room wall - the colors you chose are perfect for the room! 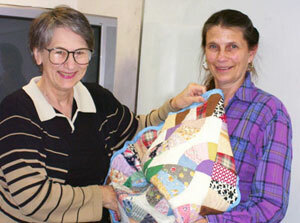 If anyone is interested in a quilt or quilted wall hanging as I chose, Margo's work is awesome. Thanks again ... I know I'll be enjoying it for years to come!